Below each tab you can find filters to quickly select items and elements. Enter text in the search bar to find items that contain that text. All columns under that tab will be searched. You can also use the query input language in the text filer. The button allows you to display and hide archived campaigns, groups, and ads. 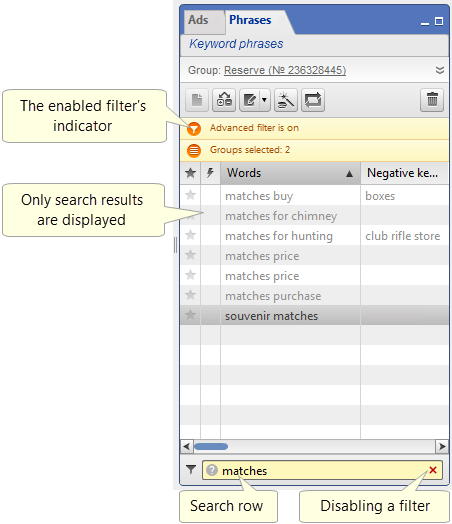 The button enables filters to search by individual columns. You can use several filters simultaneously. If several filters are enabled, only items that simultaneously apply to all filters will remain in the tab. 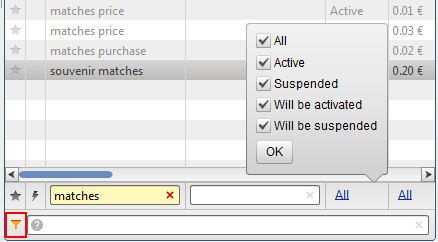 To clear all column filters, right-click on the icon and select Reset in the context menu that opens up.